Dirt with Coniferous Litter is only found naturally on the floor of coniferous forest biomes. This block does not occour in the v6 map generator. Neighboring dirt will turn into dirt with coniferous litter exposed to sunlight after some time. It can be mined by a shovel; the hand also works, but much slower. 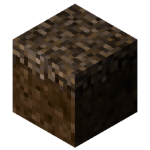 When mined, the player receives an ordinary dirt. It supports the growth and spreading of saplings and small plants, just like Dirt with Grass. This block can be made into soil using a hoe. This block will turn back into regular dirt if it stands too long in the shadow.